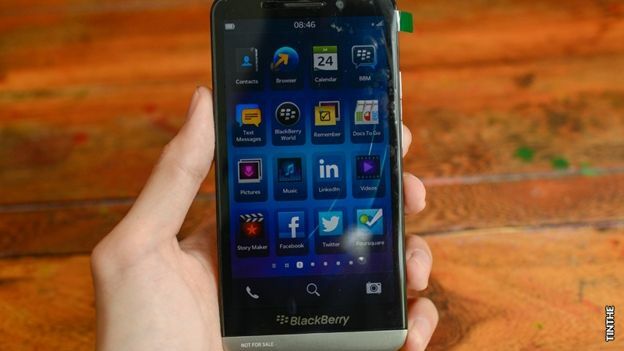 A high-definition video of BlackBerry's next smartphone – the A10 – has leaked. The video shows the BlackBerry A10 next to a silver Z10. It was posted by Vietnamese blog Tinhte.vn. It reveals that BlackBerry's A10 is significantly larger than the earlier Z10. Alongside the video, the site also posted the A10's specs. It said they include a 1.7GHz dual-core Qualcomm MSM8960 processor, a five-inch AMOLED display, an eight megapixel rear camera and a two megapixel front-facing camera. It is also said to feature 2GB of RAM, 16GB of internal storage and a 2,800mAh battery. The story tallies with earlier reports about the A10. Earlier this month, tech blog BGR posted the first images of the A10. The BlackBerry A10 is likely to launch as part of the company's smartphone line up later this year – possibly in November. It is expected to focus on gaming and power applications.